The name M'Ghie is said to have it's first recorded use as MacEthe in Dumfries, Scotland in 1296. The common American surnames of McGee, McGhee, and Magee share this root. These names (and other variants) are all treated as the same for the purposes of this project. Tradition has it that the land later known as the Parish of Balmaghie in Kirkcudbrightshire, Scotland was settled, perhaps in the ninth century, by an Irish chieftain of the M'Ghie name. The M'Ghies held land there for upwards of a thousand years until a descendancy to female lines ended the reign. In the early seventeenth century the 'Plantation of Ulster' by the English and Scots was begun and a number of MacGees settled Ireland during that time. Starting in the early eighteenth century and continuing sporadically until the start of the American Revolution, large numbers of these Scotch-Irish, or Ulster-Scots as they are also called, emigrated to America. The ancestors of many present day McGees set foot in America during that period and more arrived during the mid nineteenth century as they fled the Irish Potato Famine. The McGee Surname DNA project seeks to identify the lines of the present day McGees and, together with genealogy research, determine how they relate to one another. The project is open to all who want to further the understanding of their McGee heritage. Surname DNA testing works because the Y-chromosome, which only males have, is passed down from father to son, virtually intact. By comparing some of the inactive areas of this chromosome, we can determine whether or not multiple individuals are closely related. I recommend the 37 marker test discounted for project members with FTDNA. FTDNA also has a 67 marker test which is likewise recommended. If this cost is prohibitive there is a 12 marker at FTDNA that can be upgraded at a later time. The 12 marker test can exclude family relationships, but more markers are required to have some confidence of reliably identifying close relationships. Please email me if you would like to discuss the pros and cons of which company to use. You can compare the markers used by various tests on the Y-Marker Comparison page. FTDNA keeps your DNA sample for 25 years and is easily upgradable throught additional testing. Since there is unlikely to be any difference between the DNA tests of siblings or near cousins, you might want to share the cost and order only one higher marker test for close relatives. Females can participate by enlisting the support of their fathers, paternal grandfathers, brothers, or other male relatives with the McGee surname. McGee Surname DNA Results and Genealogy - See the results of McGee DNA that have completed testing. Available for males with McGee Surname. Individuals with the surname of McGee, Magee, McGhee, McGehee, or one of the other variants, could potentially be associated with one of these clans. DNA testing can help to identify which, if any, clan associations you might have. Nothing can substitute for good genealogical research with solid paper trails, but DNA testing might help identify ancient origins as well as help confirm more recent genealogical relationships. In the absence of proven documentation, the testing results may be useful in guiding the direction of future research. DNA Basics - more in depth: Cell chemistry, DNA Replication, DNA Sequencing, etc. Photo Journal of the DNA Collection Process - the Dorsey Project provides a light-hearted documentation of the DNA collection procedure. Web Based Y-DNA Comparison Utility for finding genetic distances, highlighting DNA differences, and finding Generations to the Most Recent Common Ancestor. MACGHIE, MACGHEE, MACGEE. Ir. Mag-Aoidh, "son of Aodh," and so same as MACKay. Gilmighel Mac Ethe of Dumfries rendered homage, 1296 (Bain, II, p. 198). In the following year, as Gille Michel MacGethe, he was thanked by Edward I for putting down evildoers and for other services (Hist. Docs., II, p. 197; Bain, II, p. 324). Gilbert M'Gy is styled lord of Balmage in 1426 (RMS., II). Robert Macgye (M'Gy, Macge, or Magy) was the king's mime, 1444-49 (ER., III, p. 150, 274, 378). John Makke made oblation by procurator in 1463 for the vicarage of St. Michael's, Dumfries (Edgar, p.135). MacGee is an Ulster name which is more usually written Magee (ct. MacGuire - Maguire; MacGuinness - Magennis, etc.). In Irish it is Mag Aodha, i.e. son of Aodh or Hugh, the Mac, as is often the case when the prefix is folloed by a vowel, becoming Mag. It has been stated that our Ulster MacGees are of Scottish extraction, having come to Ireland during the Plantation of Ulster in the early seventeenth century. There certainly is a numerous Scottish family so called, who are akin to the MacDonnells and claim descent from Colla Uais and so an Irish origin. There are Gaelic Irish MacGees also. They belong to the country on the borders of Counties Donegal and Tyrone. The name is more usually associated with Co. Antrim because the large isthmus on the east coast of Lough Larne is called Island Magee and this territory was at one time in the possession of the Magees. In early mediaeval times a MacGee was chief of a sept in Co. Westmeath but these were dispersed after the Anglo-Norman invasion. The early history of the MacGees is thus rather obscure, but people of the name were prominent in various phases of Irish life in the eighteenth and nineteenth centruy. Most of these were northern Protestants, among whom were Most Rev. William Magee (1766-1831), Archbishop of Dublin and mathematician, his grandson William Connor Magee (1821-1891), strong opponent of Gladstone's Irish policy, rector of Enniskillen, Dean of Cork and finally Archbishop of York. Martha Magee (c.1755-1846), was the founder of Magee University College at Derry; two John Magees (1750-1809 and 1780-1814), father and son made history by their fearless journalism in their paper "The Dublin Evening Post." Two others (Catholics) the brothers Thomas D'Arcy MacGee (1825-1868), and James E. MacGee (1830-1880) were associated with the Young Ireland movement and wrote many patriotic works; both went to America and the former was shot by one of the Fenians whose activities he had denounced. Three prominent American citizens whose names illustrate various spellings thereof, vis. William John McGee (1853-1912), geologist, Charles McClung McGhee (1828-1907), financier, and Christopher Lyman Magee (1848-1901), politician and philanthropist, were all of Irish extraction. Taken together these names are among the 100 most common names in Ireland and among the twenty-five most common in Ulster. Magee is found mainly in counties Antrim, Armagh and Down, and MacGee in counties Donegal and Tyrone. The names can be of Scottish or Irish origin. In both countries the Gaelic form is Mag Aoidh, 'son of Hugh'. With names like Magee and Magill the Mag- form is more common in east Ulster and the Mac- from in the west. Islandmagee on the Antrim coast was once the seat of the Magees, a prominent Irish Gaelic sept. There were also MacGees, recorded as Muintear Mhaoil Ghaoithe, an important ruling sept in medieval Tirhorky in the barony of Kilmacrenan. Among from these, the majority of Ulster Magees or MacGees will be of Scottish origin, descendants of settlers who came to the province at the time of the Plantation. The name is found in Scotland as MacGee, MacGhee, and MacGhie and was first recorded in Dumfries in 1296. There, and in Ayrshire and Galloway, the name is most common. These were kin to the MacDonald MacHughs or MacKees (see MacHugh and MacKay). The name Magee is most concentrated in Antrim around Crumlin, and in Down in Lecale and on the adjacent Upper Ards. MacGees and Magees in Fermanagh are mainly a branch of the Maguires, descendants of Aodh, great-grandson of Donn Carrach Maguire. In Co. Cavan Magee has become Wynne and Wynn because of the -gee ending, which sounds like the Gaelic gaoithe, meaning 'of wind'. Mag Aoidh means son of Hugh. It can be of Scottish or Irish origin and today it is numerous in Ulster, particularly spelled Magee, with MacGee coming second in popularity. In the Republic, both Magee and MacGee are equally common. Their Irish lineage descends from Colla Uais, whose territory bordered Donegal and Tyrone. At Lough Larne, the peninsula of Islandmagee marks their early Ulster territory. Until the arrival of the Normans, there was also a MacGee chief of his sept in County Westmeath. There were a number of Ulster Protestant Magee archbishops, one of whom accused the Roman Catholic Archbishop of Armagh of placing a calf's head on the altar of a chapel in Ardee! In Dublin's National Library there are letters written by James Maighee describing his activities in 1717 at Dunkirk, where he was spying for King James II. Early in the nineteenth century, a father and son both called John Magee fearlessly exposed political and legal corruption in their newspapers, "Magee's Weekly Packet" and "Dublin Evening Post." They suffered frequent court cases and heavy fines. John Magee the elder was so incensed at the harsh treatment meted out to him by the Chief Justice, Lord Clonmel, that he organized a hugely popular pig hunt around Clonmel's County Dublin home. The pigs caused considerabel destruction when they broke into his grounds. Magee was eventually imprisoned in Newgate, but his newspapers did expose many scandals. Martha Maria Magee (d. 1846), nee Stewart, was married to a Presbyterian minister called William Magee. Both he and their two sons died prematurely and she moved to Dublin, where her two brothers lived. They left her a fortune which, after much legal wrangling, went to the founding of Magee College in Derry city, later an important part of the new University of Ulster. From "A genealogical History of Irish Families with their Crests and Armorial Bearings" by John Rooney (1895). Thanks to cousin James C. McGee for providing this reference. The McGee Family Crest No. 214, Plate 5, Page 163. "He has preferred honesty to advantage"
The McGee family is descended from Milesius, King of Spain, through the line of Heremon, eighth son of that monarch. The founder of the family was Colla Meann, son of Eocha Dubhlien, or Doivlen, King of Ireland, A.D. 285. The ancient name was Gaid, signifying "Father." The title of the chief of the sept was Prince of Orgiel, and the possessions of the Clan were located in the present counties of Lietrim, Down, and Antrim. In the Eastern portion of the latter county the peninsula called Island Magee juts out into the ocean. In this locality the McGee family were extremely numerous. Island Magee is noted in Irish History as the scene of one of the bloodiest and most atrocious massacres ever perpetrated by the English in Ireland. On the 8th of January 1642, Monroe, the Covenanter, Governor of Carricfergus, sallied forth from that town with the Scotch garrison and a number of English "Undertakers," and massacred the entire population of Island Magee, to the number of three thousand. Many of these were persons who had taken temporary refuge of the island. There have been many eminent members of this family within the current century. The famous Dr. William Magee, Protestant Archbishop of Dublin, was one of the ables intellects of his day, and the late Archbishop Magee of York, England, grandson of the former, was no less distinguished for his eloquence and ability. Two of the name, Captain James McGee and Captain Bernard McGee, served on the sea during the war of the American Revolution. The former was for many years a member of the Irish Charitable Society of Boston, and in 1810 was President of that organization. The latter was also a member of that body. In 1812 a young man of this name who had been a Lieutenant in the United States service, resigned for the purpose of joining in the movement of revolutionizing the Spanish colonies bordering the Gulf of Mexico. Having raised the standard of independence on the Sabine and Trinity Rivers, in the present State of Texas, he crossed the Sabine with about eight hundred men, one-half of whom were American riflemen, and the rest Spanish, under the command of one Bernardo. McGee captured Nacogdoches, and afterward La Bahia, and with his four hundred Americans he withstood the siege of the Spanish forces for three months, meantime creating so much havoc in their ranks by his sorties that they were finally comelled to raise the siege and withdraw to San Antonio. At the close of the siege McGee died, in the twenty-second year of his age. Thomas D'Arcy McGee, orator, poet, historian, statesman and journalist, one of the most versatile geniuses that Ireland ever produced, is too well known to the general reader to need more than a passing mention. While yet a mere youth he was one of the most prominent of that brilliant band who led the Forty-eight movement in Ireland. Having escaped to the United States, where he remained some years, he removed to Canada. He was the original author of the Confederation of the Canadian Provinces, and was a member of the Cabinet of the New Dominion. He was assassinated by a "crank" in the forty-third year of his age. His works, in prose and poetry, are among the most valuable in modern Irish literature. Colonel James E. McGee, brother of the former, was an officer in Meagher's Irish Brigade, during the late Civil War, and was noted for his bravery. During one of the bloodiest engagements of the Peninsula he picked up the Irish flag, after three color-bearers had been shot down in succession, and carried it forward. He is the author of several excellent volumes, chiefly on Irish historical subjects. From Ireland: History, Culture, People by Paul Brewer (Editor), p.342; Dean's note: This book has nearly as many quality color photos as it does pages. I highly recommend this book for anyone interested in a photo-journey to historic Ireland. Unbelievably reasonable price! Magee, and its variants McGee, MacGee, etc., come from the Gaelic Mac or Mag Aodha, from Aodh (anglicized "Hugh"), a very popular personal name meaning "fire," which also gave rise to a large number of other surnames, including Hays, Hughes, McHugh, and McCoy. The form "Magee" reflects the pronunciation of Ulster and Scottish Gaelic, with "Mag-" most common in the east of the province, and "Mac-" in the west; Ulster is the area where the name is most common by far. It can be of either Scottish or Irish origin. Three Irish families of the name are recorded: in the area now on the borders of counties Donegal and Tyrone, in the territory around Islandmagee on the coast of Antrim, and in Fermanagh, where they descend from Aodh, great-grandson of Donn Carrach Maguire, the first Maguire ruler of that region. The remainder of the Ulster Magees are descended from seventeenth-century settlers from Scotland, where the surname is most common in Dumfries, in Ayrshire, and in Galloway. In County Cavan, Mag Aodha has also sometimes, strangely, been anglicized as "Wynne," from a mistaken resemblance to gaoth, "wind". It has been stated that our Ulster MacGees are of Scottish extraction, having come to Ireland during the Plantation of Ulster in the early seventeenth century. There certainly is a numerous Scottish family so called, who are akin to the MacDonnells and claim descent from Colla Uais and so an Irish origin. There are Gaelic Irish MacGees also. They belong to the country on the borders of Counties Donegal and Tyrone. The name is more usually associated with Co. Antrim because the large isthmus on the east of Lough Larne is called Island Magee and this territory was at one time in the possession of the Magees. In early mediaeval times a MacGee was chief of a sept in Co. Westmeath but these were dispersed after the Anglo-Norman invasion. Over the generations, immigration has carried Islandmagee's progeny to distant parts of the globe. Vikings made use of Larne Lough or "Wulfric's Fjord". In the late middle ages members of the clan Magee moved from the Hebrides to the peninsula inspiring the modern name. by Norman J. M'Kie, M.D. ; from "The Gallovidian, an Illustrated Southern Counties Quarterly Magazine" No. 26 - Vol. VII, Summer, 1905, pp 99-103. From the ninth century, when parishes got their names, and Balemakethe, now Balmaghie, was named after its principal landowner, until the nineteenth, when the daughters of John M'Ghie of Castlehill, who was descended from Balmaghie through Airie and Airds, parted with the estate, there have been landowners of the name and clan in Galloway. The name M'Ghie is a modification of what was once a favourite Celtic appellation, Aodh or Aed, sometimes written Eth or Heth and latinized into Ethus. on the name Mackay ... The Gaelic form is Mac Aoidh, son of Aodh. The name Aodh is common in the ancient history of the Gael, both in Scotland and Ireland. ... therefore Aeduus or Aeduan means quite the same as Mackay, the former meaning 'belonging to Aedu,' the latter 'son of Aedu.' The further meaning of aedu-s is also known; the word means 'fire,' 'hearth.' It appears as such in Irish and Welsh, and is allied to the Latin aedes (house) Aedilis, the Roman Dean of Guild, and the Greek aitho (I Kindle). All this may, of course, be equally said of M'Ghie and M'Kie. The Celtic Aodh is the Norse Odo and the Norman-French Hugh. In old Galloway documents M'Ghie and M'Kie are used indiscriminately. I. The M'Ghies of Balmaghie The tradition is that the lands and church derived their name from an Irish chieftain who settled there in early days. The earliest historical notice of the name is in the beginning of the 12th century, when "the church of Kirkandrew, Balemakethe," is mentioned by Fergus, Lord of Galloway, to the Abbey of Holyrood. ... The M'Eths, who gave their name to the lands and the church, must, therefore have been settled there in the eleventh century at the latest, but, as parishes were formed as early as the ninth century, we may pretty safely conclude that the M'Ghies were there then. Gilmyhel MacEth signed the Ragman Roll in 1296; Micheal Macge submitted to Edward III. in 1339; Gilbert Macge is called "lord of Balmage" in 1426; in 1460 Gilbert M'Gy is of Balmagy. This Gilbert was succeeded by William M'Gee, who gets sasine of Slagerre (Slogarie) in 1471. 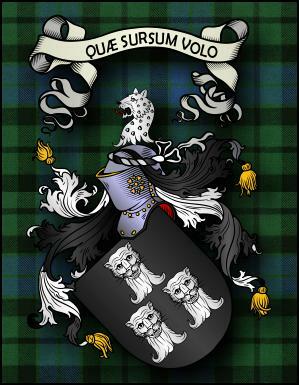 Sir George MacKenzie gives the coat-of-arms of M'Ghie of Balmaghie, as "Sable, three leopards' heads erased, argent." 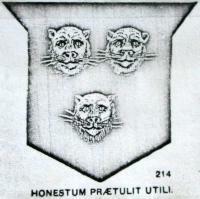 Nisbet, in his Heraldry, says--The name of M'Ghie, three leopards' heads, argent. The principal family of the name is designed of Balmaghie, who makes the heads. II. The M'Ghies of Airie and Airds The M'Ghies of Airie and Airds are a branch of the M'Ghies of Balmaghie, but it is difficult to point out when the offshoot took place. In December, 1642, James M'Ghie had sasine of the lands of Airies and Culquahassan. He married, first Janet Gordon, and, second, Anna Kennethie. By the latter he had a son, Alexander who succeeded. III. The M'Ghies of Castlehill John M'Ghie of Castlehill, in the Parish of Troqueer, married Jean, daughter of the Rev. William Donaldson, minister of Parton, by whom he had six daughters-- Mary, Isabella, Elizabeth, Jane, Wilhelmina, and Ann. [p.105] The ancient name of this parish was Balmakethe. The church of Saint Andrew or Kirkandrew of Balmakethe was one of those churches bestowed by Fergus, first lord of Galloway, on Holyrood Abbey. In 1287, the monks of Holryood obtained a confirmation of this church from Henry, bishop of Galloway. The subsequent name of the parish is believed to have been given or taken from the Macges, who seem to have obtained the principal lands in the fourteenth century, as will be seen under Balmaghie. Chalmers states that the prefix bal in Gaelic is a dwelling, but he couples it with the M'Ghies, which is an error, as the early name proves. Besides, it is Irish, and not Gaelic. In the latter language the word "baile" is a town, a village, &c.
[p.106] In 1606, Alexander M'Ghie of Balmaghie obtained from King James VI. a charter of lands in the parish with the advowson of the church. In 1786, with the lands of Balmaghie, it passed to Thomas Gordon. The size of the parish as it now is, is about nine miles in length, and varies from about four to six miles in width. In Pont's map it is spelled Balmagy. [p.107] The history of the M'Ghies is that they were of Irish extraction, and chief of the name settled in Galloway. This is very probable. On the coast of Antrim there was the Isle of Maghee, which now is a peninsula of Lough Larne. We have read, however, that M'Ghie is a corruption of Mackay, which seems improbable. In support of this, it is stated that the arms of the M'Ghies are the same as borne by the chief family of the Mackays. This is certainly a guide in some cases, but that the Mackays of Sutherlandshire and the M'Ghies of Galloway are one and the same, we do not credit. The first bearing the name found in the district is Michael Macge, who, as a landholder, submitted to King Edward III. in 1339. This servility to the kings of England has been the means of handing many a name down to posterity which otherwise would have been lost. The Ragman Roll of Edward I. has been valuable to genealogists, and in the same way those who succumbed to his successor have had their names also recorded; with this difference, however, that the first Edward was a formidable enemy to Scotland, while his son was a weak monarch. [p.108] William Macge of Balmage appeared in a cause before the lords auditors of Parliament in 1478, and acquired from James III., on the 14th August 1484, a charter of the lands. It is thus evident that the family was free from the crushing influence of the Church, when exercised wrongly. On the 26th June 1599, Robert, brother of Alexander Glendonying, had retour of the lands of Barnboard. New charters were obtained by the M'Ghies from James IV. in 1513, and James V. in 1527. ... In 1586 Alexander M'Ghie was in possession. ... In 1606 Alexander M'Ghie of Balmaghie ... obtained from James VI. a charter of the lands and barony of Livingstone, and the land of Slogarie, with patronage of Balmaghie church. from "Ordnance Survey Memoirs of Ireland, Vol. 10, Parishes of County Antrim III, 1833, 1835, 1839-40; Larne and Island Magee", edited by Angelique Day and Patrick McWilliams. Pages 14..105 relate to the Parish of Island Magee. [p.14] The peninsula of Island Magee includes a tract of country 7 and a half miles in extreme length from south south east to north north west and varying in breadth from 1 and a quarter to 2 miles. [p.20] There is neither town, village nor gentleman's seat in the parish of Island Magee. [p.26] The numerous pagan and ecclesiastical remains in this parish are sufficient indications of its having in very remote ages not only been inhabited but also of its having been a place of no little celebrity among 2 very different races, of whom there are not now remaining any other evidences, the present inhabitants being almost to a man the descendants of the Scottish settlers of the 17th century and still retaining in their habits, manners, dialect and religion the striking characteristics of the country of their forefathers. The parish is generally believed to have derived its name of the family or clan the Magees <Macgees> to whom it is said to have originally belonged and by whom it was formerly inhabited. It is also said that it has from early ages belonged to that family, and that their extirpation and dispossession took place on the alleged massacre of the Roman Catholics on the 8th January 1641. There are, however, several circumstances and evidences in direct contradiction of this. The stone which was found among the ruins of the very ancient castle of Portmuch bears an inscription which some interpret as Island Magee. This, however is uncertain. It is alleged that the parish has not derived its name from the of the family alluded to, but that its original name was Mac'iagh, signifying a "seagul", a name which, if authentic, would have been very reasonable from the vast number of gulls which frequent its coasts. Tradition states that the parish, from its exposed situation, was subject to incursions from the Danes and from the Scots, that it was frequently plundered by the latter and that the castle of Portmuck, now in ruins, was erected in connection with the defences on the little Isle of Muck, on its eastern coast for the protection of its inhabitants. Castle Chichester is said to have been erected at a subsequent period. A village existed about the latter castle, and from it there was a considerable export trade to Scotland down to the beginning of the 18th century, until which period the mail packet for Scotland was dispatched from thence. A small boat conveyed the letters between Belfast and Castle Chichester. About the middle of the 17th century, this district, which had previously been church property, was exchanged by the bishop to the Chichester family for the parish of Glynn on the opposite coast of Larne Lough. [p.27] The colonisation of the parish by the Scots which had commenced in the beginning of the 17th century, had been proceeded by partial settlements of the English followers of the Earl of Essex, who landed at Carrickfergus in 1578 and possessed themselves of the adjoining parish of Templecorran and several others which were confirmed to them by the Crown. About the year 1610 several of the Scots settled here and their numbers must have rapidly increased, for in 161[last figure blank] we find the Reverend Edward Bryce (the first Presbyterian minister who preached in Ireland and who had settled in the adjoining parish of Templecorran) preaching here on every alternate Sunday. In 1641 and during 1642 the parish seems to have been finally colonised by the Scots, many of whom, as the tombstones in the burial grounds justify, were the ancestors of its present occupiers. Under this head will be found the traditional account of the massacre of Island Magee, or the massacre of the Gobbins, of which so many very conflicting contradictory statements have appeared in the different historical publications, not merely local, but of the entire kingdom, not one of which is entitled to the least credit, either as to the individuals by whom or the motive from which the circumstances originated, or as to the numbers killed. In each successive work the number has been augmented. At first it was stated that 6 individuals fell, a subsequent publication made it 6 families, consisting of 30 individuals. These were multiplied by 10 in a later work, and finally augmented to 3,000, at which the humanity of historians has allowed them for the present to remain. It is stated by many in the neighborhood that the inhabitants of the parish have increased the numbers killed in proportion as the accounts given in the histories alluded to have reached them. So much so, that though the tradition and belief formerly was that many individuals fell, it now is that the parish was depopulated, principally by the numbers put to death, and partly by those who fled for safety. The little bridge of Slaughterford is on the road from Carrickfergus to Island Magee ... The origin of its name is locally and historically ascribed to the slaughter of several of the inhabitants of the parish of Island Magee, which took place on the evening of Sunday 8th January 1642 by some of the Scottish troops quartered in this county, in retaliation, it is said, for some atrocities committed on their friends and comrades in different parts of this country during the previous week. ... [Insert footnote: "Scotch" and "Irish" equal Presbyterians and Roman Catholics]. The rebellion which had broken out in October 1641 was accompanied by many horrible butcheries of the Protestants by the Roman Catholics, but especially those in the parish of Billy and in the Route, where some companies of Archibald Stuart's (of Ballintoy) regiment were put to death, and finally at Clough or Oldstone Castle, 6 miles from Balymena, where the garrison, after having capitulated, were allowed to march out and then their wives and children were taken to the banks of the Glenravel river and butchered by Toole McHugh O'Hara. The last occurrence took place on the 2nd January 1642. It soon reach Carrickfergus, then the garrison and place of refuge for the Protestants of the county. The men of Adair's regiment, being from the neighborhood of the scene and probably having lost some friends, naturally were exasperated and on the evening or night of Sunday 8th, set out for Island Magee, determined on revenge. They first came to the house of Owen Magee, who, with 8 of his family, they killed, his son Bryan alone escaping. They then proceeded to the house of Daniel Magee, the next on their route, and him, with 9 others, were murdered by them. Several others, from 40 to 50 in all, were slaughtered, and several were brought prisoners to Carrickfergus. Many were put to death in the parish with great inhumanity. A child was stabbed to death in its mother's arms, and several women fell victims to the revenge of the murderers. One woman who had fled to the verge of the Gobbins before an officer who pursued, seeing no chance of escape, clasped him in her arms and threw herself with him over the precipitous cliff, at the base of which both were dashed to pieces. This is said to have been the only inhabitant who fell over the Gobbins, though many accounts go so far as to state that numbers were driven over the Gobbins and that the massacres, having commenced at the Slaughterford bridge, was carried on until numbers who had fled were driven over the cliffs. An inhabitant named Hill, a Protestant, is said to have saved many of the Roman Catholics by concealing them in a lime kiln. Of the prisoners brought to Carrickfergus, 3 were put to death by Colonel Adair's orders, Colonel Hill being absent, and several of the others were punished. from Between Two Revolutions - Islandmagee, County Antrim 1798-1920, by Donald Harman Akenson, 1979. [p.33] Mention of the native population leads to one of the most vexing questions about Islandmagee: when and how were the original inhabitants displaced, and who were they? In the sixteenth century, Islandmagee came to be dominated by the family of Magee, who came originally from Islay in Scotland and were retainers and relatives of the MacDonald Lords of the Isles. Precisely whom they displaced is uncertain, although the dating of the Magee influx to the years 1550-70 can be postulated with a reasonable degree of probability. To compound the historical uncertainty, these Hiberno-Scottish Magees were themselves displaced by British Protestants in a series of transactions that are largely unrecorded. My own speculation is that the displacement of the Magees began with the Essex patent of 1576 and that it gained momentum with the introduction of the English relatives of Sir Moyses Hill in the late sixteenth and early seventeenth centuries. That the displacement of the Catholic Magees soon was recognized as inevitable and irreversible is indicated by the fact that in July 1620 the Catholic first Earl of Antrim granted lands of 280 acres at Murloch Bay on the north Antrim coast to Alexander Magee. Then during the Irish civil wars of the 1640s, a considerable number of the remaining Catholics were killed (see pp.139-40). The evidence of family names makes it clear, however, that a significant minority of the earlier population remained and that this minority converted to Protestantism and adopted the cultural norms of the dominant group. The name Mackay, which takes various forms as McGhie, Magee, Mackie, and so on, is derived from the old Gaelic aodh or aedh, which means fire. The common English form of this name is Odo. In northern and western Scotland the name takes the form of Mackay or McKay, and in the lowlands Mackie and McGhie, and in Ireland Magee. Common belief is that the Mackays of the North of Scotland, owing allegiance to Lord Reay, are not related to those of Argyleshire. For instance, Johnston's little handbook on the "Scottish Clans and their Tartans" (1) [10th edition, p.57 "Mackay"] states there is no connection between the Mackays of Clan Morgan owing allegiance to Lord Reay, whose arms, as it points out, are based upon those of Forbes, to whom they claim a relationship, and upon which assumption about 1608 they adopted the Forbes arms. While denying the relationship between the northern and southern families, Johnston's book generally concludes that the Mackays of Islay and those of Kintyre are of the same origin (2) ["The Scottish Clans", op. cit., p.57]. Contrary to these generally accepted views, there is now a common tendency developing coincident with the growth of clan societies and unproved, but socially convenient, "relationships" based on clan names, which is quite the reverse in its conclusions to those cited. To-day there is an unmistakeable trend towards lumping all those of the name Mackay and Magee into one original race in Ireland, and to consider the Mackays and Macghies, and, presumably Mackies, in Scotland, as widely scattered branches of the Clan Mackay of the North. As a consequence, it may be resented by some of the followers of Lord Reay that the purpose of the present essay is not merely to dispute but disprove these common assumptions, for which it is needless to say no evidence has ever been adduced. The result of these arguments will, no doubt, be to create difficulties for the officials of the Clan Mackay Society, if anyone troubles to read and take notice of this essay at all. For, if they do, they cannot any longer take the facile line of enrolling all Mackays, Mackies and Macghies as Lord Reay's followers in their clan society! It will, strictly speaking, be necessary to enquire of all Mackays who wish to join as to which Mackays they are. It is true that nine out of ten of the name will no doubt be of the great northern Clan Mackay. Even so, there will always be doubt where a proved pedigree cannot be produced. Furthermore, does not this open up a real question long overdue for ventilation - namely, the acceptance in general belief in Scotland of the surname as evidence of clan affiliation. We have seen that there is a prima facie reason for believing that there are two Clan Mackays, distinct in race and location, the one of Northern Scotland and the other of the South-Western Highlands and Isles. Might not this be so in the case of many other surnames? That this may be so is even more likely, when we find that besides the Argyleshire and Reay Mackays, the Rev. Wm. A. Gillies in his painstaking work (3) ["In Famed Breadalbane", Perth, 1938, p369] points out that the MacNaughtons of Loctayside were divided into four branches - McVicars, Mcintaylors, Urchy McNaughtons and Mackays! There are two clan Mackays, which, even if of the same original stock, were not in any way connected during the historic period when clans played a major role, first in Scottish and then in British history. Besides these two clans, there were one or more individual families or septs of other clans of this name. The clan Mackay of the north of Scotland in Sutherland had a more sharply defined entity, and remained a cohesive whole, firstly because its geographical location contributed to that end, and secondly because it was not involved on the losing side in any major historical war between two opposing forces. The southern clan Mackay in contrast was geographically based upon the sea which lies between Scotland and Ireland, and it soon became distributed around that sea, in Islay, Kintyre, Galloway, and northern Ireland. In addition, being associated with the overthrow of the Lordship of the Isles and the dispossession of the Macdonalds, this tendency to disperse around the Scoto-Irish sea was expedited and ultimately enforced in the bitterness of defeat. Because the northern Mackays were independent of any immediate and dominating overlords, they were able to absorb their own peasantry and dependents within themselves, thereby swelling the numbers of their own name. In contrast, the southern Mackays, overshadowed by the Lords of the Isles, and always fighting in their host, and never as an independent organization, were not in a position to increase their numbers in that way, since the plebians would tend to assume the name Macdonald rather than Mackay. But, as a consequence of this, arising from the very weakness of the southern clan Mackay, all those of the name among these southern Mackays are actually Mackays of the houses and kin of their chiefs, and not merely dubbed by the name of the family whose fortunes they followed. Furthermore, not only were the southern Mackays a clan distinct from that of the northern clan, from what has already been said in this summary, but they were so recognized, as is shown from quotations in this essay, by the Scottish Government; and, further more, they were even recognized latterly as in two clans, those of Kintyre being referred to separately form those in the Rhinns of Islay. These facts are further emphasized by the Mackays of the South living around the Scottish-Irish Sea having a common coat of arms of 3 leopard's heads, and traces of other coats associating them with the lordhsip of the Isles. Finally, the crest of the Mackays of the South would seem to have been a vested arm embowed holding a scimitar, but of what tinctures it is now hard to say. The tartan of the southern Mackays, as yet, is still unknown, but often they must have marched with and perhaps even born that of the Macdonalds. What is its authority I do not know. But, if of independent source, it confirms the above pedigree, for where it differs it is only due to two omissions, or insertions, as the case may be. In any case, there is, to my knowledge, no more evidence that the above pedigree is that of the Kintyre Mackays any more than that of the Mackays of the Rhinns of Islay, who were, if anythng, a more important branch. If, as we conclude most have done in the past, that they were of common origin, this is their common pedigree. On the other hand, as already pointed out, there is not a single point of contact between the pedigrees of those southern Mackays and those of the north, even if we go back to the beginning, which cannot be later than the 10th century, and perhaps earlier. Any relationship earlier than this is gettng towards the proto- historic period, and can be discounted from the point of view of family relationships. Not only is there no relationship between the pedigrees, but the best that one learned advocate, in private correspondence with the author can do, to show contact between the Mackays of the North (of Strathnaver) and those of the South, is the marriage of Donald, chief of the Mackays of the North, who, c. 1300 to 1330, married a daughter of Iye, son of Neil of Gigha, between Islay and Kintyre! This is no evidence, even if it were a marriage with one of the Mackays of Islay or Kintyre, and not, as it is, with a McNeil! More than one such marriage, and more comings and goings would be needed to establish consanguinity, and active knowledge of an belief in such kinship, between these two wiedely separated breeds of Mackays. Another point of some importance is that the pedigree of these Argyleshire Mackays calls them Clan Aodh (Hugh), whereas the Northern, Strathnaver, Mackays were always called by the Gaelic bards and historians the Clan Morgan. This suggests a decided distinctness of origin from the beginning.